Baffles are great way to add an acoustic treatment to the room while only partially covering the ceiling. Since Baffles are suspended vertically and the surface area exposed for sound absorption is doubled and higher NRC levels can be achieved. Decoustics custom engineers Fabric, Claro and Wood finished baffles to a wide range of unique shapes and colors with the option of wire suspension or direct mounting them to a T-bar grid. 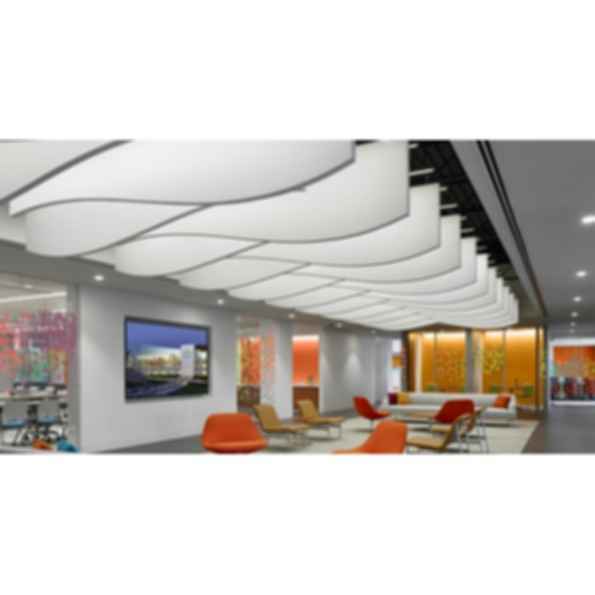 Decoustics acoustical fabric Baffles consist of two 1" (25mm) thick cores assembled to produce an overall 2" (50mm) thick baffle which is then upholstered. An optional foil-type septum between the two panels is available to aid in containing sound within an area. Fabric Baffles are available in three types: Type 10, Type 20 and Type 30, which is also referred to as a Free Hanging Screen. The difference between the baffles is the bottom edge detail and the baffle shape. Decoustics Claro and Wood Baffles are customizable to a wide range of unique shapes and various thicknesses with the option of cutting shapes out of the material for visual impact.